Kusess: Free SPM Seminars by EduNation! Free SPM Seminars by EduNation! 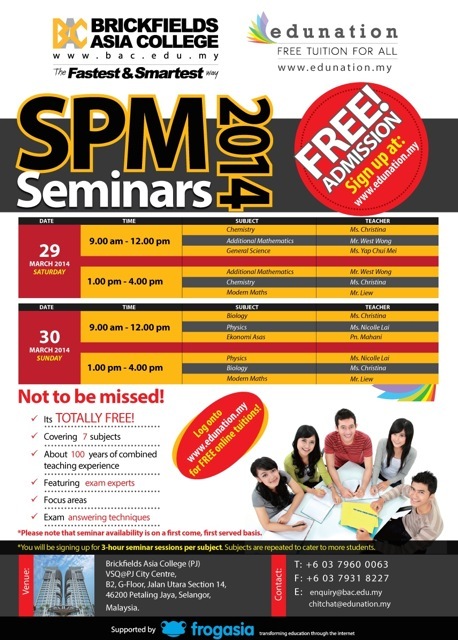 Sign up for FREE SPM Seminars by EduNation Malaysia! Are you teaching Form 5 students sitting for SPM this year? Or a parent looking out for seminars that will benefit your child? Get your students to sign up for Edunation's FREE SPM Seminars coming up on the 29th - 30th March 2014! Edunation is one of our FrogStore partners with lots of great Maths tutorial videos created by local educators that students love. Last year, their SPM seminars were a hit and fully booked, and they are back again this year! Don't miss these popular SPM seminars happening on the 29 and 30 March. Get your students to hop on over to EduNation Malaysia to find out more or click below to sign them up! EduNation is dedicated towards providing Malaysian students a free and complete educational resource so that any student whether rich or poor would benefit. They are a volunteer driven organisation passionately pursuing an educational agenda for all Malaysian primary and secondary school students. Hop in today to check out EduNation's channel on the FrogStore! Copyright © 2014 FrogAsia Sdn Bhd, All rights reserved. You are receiving this e-mail because you have signed up to be part of the coolest, out-of-this-world word-building game, Word Mania!